Patrick Seale's latest book "The Struggle for Arab Independence" traces the history of the Middle East from the final years of the Ottoman Empire up to the 1950s, focusing on the remarkable career and personality of Riad el-Solh, independent Lebanon's first prime minister. How did the idea for your latest book, “The Struggle for Arab Independence”, come about? Most of my earlier Middle East books were about the post-Second World War period — for example my biography of Hafez al-Assad, father of the current Syrian President, who ruled for 30 years from 1970 to 2000. So I was always keen to learn more about the earlier period of Middle East history, from late Ottoman times onwards. This latest book gave me the opportunity to do that. It is a particularly important period as it is there that the roots of many of today’s conflicts are to be found. Why did you choose to concentrate particularly on the life of Riad el-Solh? One of his daughters, Alia, happened to be with me at Oxford. Our friendship was renewed in Paris in the last decade, when she repeatedly urged me to write her father’s life. The more I looked into the idea, the more I realized it would be a good “peg” on which to hang the history of the first half of the twentieth century. Riad el-Solh was the leading pan-Arab statesman of his time. His life spanned the last years of the Ottoman Empire right up to 1951, when he was assassinated. What sort of man was Riad el-Solh? He was a remarkable character, with great qualities of charm, wit and shrewdness, a born politician. He had more international experience than most Arab politicians of his day because he had spent his youth in Istanbul, where his father was a deputy in the Ottoman Parliament. He witnessed the dying days of the Empire, politically a highly instructive experience. After the First World War, and after the carve-up of the Empire’s Arab provinces by Britain and France, he found himself in Damascus where his father was Minister of Interior in Emir Faisal’s ill-fated government. He was there when French troops expelled Faisal and imposed the French Mandate. He became an exile, a revolutionary, a campaigner against France at the League of Nations and elsewhere. He was on intimate terms with all of the leaders of the region and was also deeply involved in the Palestine question. He was, in fact, a major actor in most of the important political crises in the region in the inter-war years. 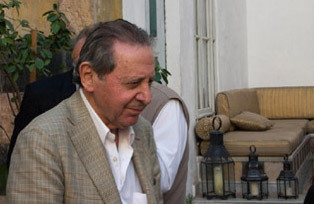 And it was he, in cooperation with Bishara al-Khoury, who finally wrested Lebanon’s independence from the French, becoming the first prime minister of the post-independence period. It was wonderful to delve into his life. It also gave me the chance to make good use of British and French diplomatic records of the period. Riad el-Solh had a great distaste for religious confessionalism, which made him somewhat unusual in Lebanon. Yes, he detested confessionalism, which happened to be the very basis on which the country’s political system had been built by the French. He used to say that he dearly wished he might never again hear the loaded words “Muslim” or “Christian”. He much preferred “citizen” – and ideally “Arab citizen.” He was indeed very unusual in that respect. Although he was a Sunni Muslim, he always sought in his political life to place himself above Lebanon’s confessional strife. He believed passionately in Muslim-Christian entente as the indispensable basis for Lebanese statehood. In that, he remains a very contemporary figure. The Arabs had a bad time of it in the post WW1 period, which was all the worse as they had just emerged from being considered second-class citizens in the Ottoman Empire. Yes, that is true. The Arabs did have a hard time in the inter-war years. They did not want the French and British Mandates, which were forced upon them. They deeply resented British protection for the Zionist enterprise in Arab Palestine. Just consider the way various Arab uprisings were brutally crushed with much loss of life – by the British in Iraq in 1920, by the French in Syria in 1925-27, and by the British in Palestine from 1936 to 1939. The Arabs did their best to throw off Western colonial rule but the road to independence was long and hard. They only managed to win a sort of freedom after the Second World War. but then, almost immediately, they found themselves confronting the new Israeli state. The Arab defeat in the 1948 war had the catastrophic result of bringing military regimes to power, from which the Arabs are only now beginning to free themselves. Given the levels of British and French duplicity that you recount, it does seem incredible that the Arabs believed anything that Paris and London told them. In a sense, they had no choice. France and Britain were the two superpowers of the day: all significant change had to be wrested from them, by negotiation or by force. The Arabs were always hoping for a shift in Western attitudes or policies. When Leon Blum became prime minister of France in 1936 at the head of a left-wing government, he did try to negotiate treaties with Syria and Lebanon to replace the hated Mandates, but he was defeated by conservative forces. The Second World War then intervened. During the 1940s, the Syrians and Lebanese were very fortunate to have the support of the British envoy to the region, General Sir Edward Spears, who was very much in favour of Arab independence. He not only upset the Free French but the British Foreign Office as well. The Free French leader, General Charles de Gaulle, was so frightened of being accused of giving up the French empire, that he felt he had to fight to the last to hold on to the Levant. As a result, Damascus was bombed twice by the French – first in 1925, to crush the great revolt of that year, and then again in 1945, on De Gaulle’s orders. Riad el-Solh was a staunch supporter of Arab nationalism. Can you explain what his view of Arab nationalism entailed exactly? Riad el-Solh fought unstintingly throughout his life for Arab independence – from the Turks, from the French and from the Zionists. He wanted the Arabs to be free and united. But he was not a frontier-smasher like the Ba‘th Party. His notion of Arab unity was more that of Arab solidarity. He believed Arabs should cooperate closely, to defend Arab causes and Arab interests. Perhaps the irony of his career was that he was eventually forced, as prime minister, to defend narrow Lebanese interests — even against Syria, a country with which he had numerous ties. Indeed, he married a Syrian woman from the Jabiri family of Aleppo. He was defeated by the western powers which, in their carve-up the Arab world, created different states, some monarchies, others republics, all with different educational systems, different currencies and different national loyalties. Eventually, he had to come to terms with that. Emir Faisal’s delegation at Versailles, during the Paris Peace Conference of 1919. T. E. Lawrence, Faisal’s black slave (name unknown), Captain Tahsin Kadry. What about Riad el-Solh’s assassination? In your book you suggest that King Abdullah I of Jordan and even the Israelis might have been involved. At this distance of time, it is very difficult to determine exactly who was responsible. The men who waylaid Riad’s car on his way to Amman airport, and who fired the shots that killed him, were members of Antun Sa‘ada’s “Parti populaire syrien”, a pan-Syrian party. Sa‘ada had attempted to stage a revolution against the Lebanese state and was executed when Riad el-Solh was prime minister. So Riad’s murder was probably a revenge killing. But who manipulated the killers? I would say that King Abdullah certainly let the murder happen. He detested Riad who had denounced his covert links with Israel. The Israelis, too, had tried to kill him a couple of years earlier after the Palestine War, and wanted him dead. They may well have been involved. I tried to have access to British files on this sensitive subject but my request was refused, probably because the files dealt with security matters. Is Lebanon an ungovernable country, due to its confessional differences? No, not really. The Lebanese are by no means ungovernable but, as they are a very spirited people, the task of governing them is not easy. They enjoy a real measure of democracy which you do not find in other Arab countries. Because the Maronites (Lebanese Catholics) have had a very long connection with France, the country is deeply impregnated by French culture. There are numerous French schools in the country as well as the University of St Joseph. English is also widely spoken, thanks to the American University of Beirut and many other private schools and universities. Beirut is, in fact, a great cultural, publishing and information hub, unique in the region. Nevertheless, like some other Arab countries, Lebanon is also a religious, ethnic and tribal mosaic. This has unfortunately led to bitter sectarian strife, most notably in the long Lebanese civil war of 1975 to 1990. Iraq suffered the same sort of nightmare – a sectarian war between Sunnis and Shi’ites triggered by the American invasion — and that is the danger threatening Syria today. What is the current status of relations between Lebanon and Syria? The two countries are close neighbours. They are cut from the same flesh. In fact the Lebanese Republic as we now know it – le Grand Liban – was created by the French by adding to Mount Lebanon territories taken from Syria. The two countries are intimately bound together by a host of financial, trading and family ties. Their security is also closely intertwined. You only have to glance at a map to understand why Syria cannot tolerate a hostile government in Beirut. Damascus, in southern Syria, is only about 20 kilometres from the Lebanese border and would be immensely vulnerable to an attack from that direction. An enemy force in Lebanon moving up the Beqaa Valley could cut Syria in two. Every Syrian regime, whatever its political colouring, will seek to keep Lebanon within its sphere of influence. That is why the Syrians fought back so fiercely when Israel invaded Lebanon in 1982 and tried to bring it into its orbit. What about Hizballah? How do they fit into the picture? Hizballah is a Shi‘a resistance movement – both a political party and a militia – which emerged as a result of Israel’s 18-year occupation of southern Lebanon (1982-2000). Its guerrillas eventually drove the Israelis out. It is the only force that can defend Lebanon against further Israeli aggressions. It is a key part of the Teheran-Damascus-Hizballah axis which, in recent years, has been the main obstacle to U.S. and Israeli hegemony in the region. Israel and the U.S. demonize Hizballah as a terrorist movement, as they also demonize Iran. Israel would dearly like to destroy Hizballah and bring down the whole axis, as it attempted to do by its invasion of Lebanon in 2006. How do you see the Arab Spring? There are two distinct revolutions taking place in the Arab World. The one which has attracted most attention is the uprising against autocratic leaders, one-party states and all-powerful security forces – whether in Tunisia, Egypt, Yemen, Libya or Syria. The Arab revolutionaries want jobs, an end to police brutality, a better life for themselves and their families, freedom and dignity. Where the revolutions have been successful, they now face the colossal task of remaking the whole state structure. It cannot be done fast and it will not be easy. Incorporating Islamist movements into the political system will also be problematic. The second revolution, which the west has largely ignored, is an uprising against Western and Israeli pressures and aggressions — in the case of the Palestinians, against Israeli occupation and oppression. The Arabs want national independence, but they are still some distance from truly achieving it. How do you read the situation in Syria at the moment? President Bashar al-Assad and his security services have been guilty of some terrible crimes by shooting and killing protesters in the street. The protest movement seems to have taken them by surprise, and the regime’s reaction to it was grossly mishandled. No doubt the President thought he was safe from an uprising, such as occurred in Tunisia and Egypt, because of his nationalist stance in standing up to the U.S. and Israel, and in supporting resistance movements such as Hizballah in Lebanon and Hamas in Gaza. But on that score he has been proved wrong. In fairness, it should be said that since coming to power in 2000, he has done a lot to stimulate the economy by introducing private banks, insurance companies and a stock exchange, by promoting the revival of the Old City of Damascus and encouraging tourism. But, preoccupied with international diplomacy, he seems to have delegated security problems to his brother and cousins. He now seems unable to control his security services. In the meantime, the opposition is divided and has not yet produced a credible leadership. The Islamists, notably the outlawed Muslim Brothers, seem to be the most powerful of the opposition forces. The real danger is that, if a political settlement cannot soon be found to bring about a peaceful transition of power, the troubles might escalate into a sectarian war between the minority Alawis (an offshoot of Shi’a Islam) who dominate the state and the Sunni majority. I am personally in favour of the international community, or some neutral mediators, intervening to bring about a cooling-off period. Somebody like a Jimmy Carter could head a mission which would include representatives from countries like Turkey, Brazil and India. The aim should be to prepare the ground for a real national dialogue. The regime has promised far-reaching reforms. It must be held to its promises. But before anything of this sort can happen, the killing has to stop. What about a NATO intervention in Syria? That is out of the question. I don’t think any Western country has any appetite for a military intervention. Not after Iraq, Afghanistan and Pakistan. The Libyan intervention will probably be the last of its kind for a long time. The fact that nobody wants to intervene in Syria is one of Assad’s trump cards. Another is the fact that the Russians would almost certainly veto any attempt to condemn Syria in the UN Security Council. The Syrian regime probably feels it can withstand sanctions, at least for several months, despite the fact that tourism has dried up, that inward investment has slowed and the Syrian pound has taken a battering. The regime is in real trouble, but it does not yet look terminal. What about some of the smaller countries like Bahrain, where revolution seems to have been stifled? Bahrain is part of the Arabian Peninsula where the dominant power is Saudi Arabia. It sees the peninsula as its exclusive sphere of influence, and will not tolerate any foreign intrusion. Bahrain is something of an exception among the Gulf States in that the majority of the population is Shi’a, whereas the ruling family is Sunni. The Shi’a feel that they have been neglected and that the country’s wealth has not trickled down to them. Most of the money has stayed in the capital, Manama, which has become an important financial centre. The Shi‘a want more representation and a bigger slice of the national cake. The Bahraini Shi’a have ancient ties with their co-religionaries in Iraq, who are now in power — one of the unintended consequences of the US invasion – and also enjoy support from Iran. These external ties have alarmed the Saudis and the other Sunni monarchies in the Gulf. This goes some way to explain the Saudi military intervention in support of the Bahreini ruling family. There is also a strategic US naval base there. Yes, there is an important US naval base in Bahrain, one of several U.S. bases in the Gulf region. Qatar, for example, is the headquarters of CENTCOM, the U.S. Central Command. Many Arabs are angered by this massive U.S. military presence. One has to ask the question: “What are these bases for? Against whom are they directed?” China is a major customer for Arab oil but appears to have no need for local bases. The presence of U.S. bases seems to be a hangover from the post-war period. Now that the US is more or less bankrupt, we will no doubt see some scaling down of the U.S. military presence. You mentioned in one of your recent articles that there was the genuine possibility of one of the many conflicts in the Middle East escalating into a fully-fledged war. The hottest potential conflict is, as usual, that between the Arabs and Israel. The Palestine problem remains unresolved. Negotiations have collapsed, indeed they never really started. Israel’s far right government, backed by fanatical settlers, religious nationalists and Greater Israeli ideologues, is land-hungry. It is expanding into occupied Palestinian territory as fast as it can and refuses to make any meaningful concessions to the Palestinians. When President Obama assumed office in January 2009 he seemed determined to achieve a settlement. He appointed a special envoy to re-launch Israeli-Palestinian negotiations and called for an Israeli settlement freeze. But he was defeated by Israel’s hard-line Prime Minister Benyamin Netanyahu, by powerful pro-Israel lobbies in the U.S. and a pro-Israeli Congress. Seeing their country being gobbled up before their eyes, the Palestinians have decided to seek United Nations recognition of their state this September. This has thrown the Israelis into a panic. The U.S. has, as usual, come out in support of Israel by making clear that it will veto any such Palestinian move in the Security Council. America’s already battered image in the Arab and Muslim world will suffer another blow. Meanwhile, the truce between Israel and the Hamas regime in Gaza seems increasingly fragile. There have been some nasty incidents which could easily trigger a full-scale conflict. Unless the international community intervenes to insist on a settlement, the situation can only deteriorate. The on-going struggle could develop into a third intifada, with great suffering for both sides. America’s surrender to pro-Israeli forces has made the situation extremely dangerous. If Europe had any guts and any cohesion it would step into the shoes left empty by the U.S. and threaten Israel with sanctions until it agreed to abide by international law. Has Israel’s strategic position changed as a result of the Egyptian revolution? It most certainly has. The 1979 peace treaty between Israel and Egypt was of great benefit to Israel but was a disaster for the Arabs. It removed the most powerful Arab country from the Arab line-up, thus allowing Israel to threaten and attack its other Arab neithbours at will. One immediate consequence of the treaty was the Israeli invasion of Lebanon in 1982. As I’ve mentioned, Israel remained in occupation of southern Lebanon for 18 years, until driven out by Hizballah guerrillas in 2000. The Israelis are, of course, desperate for the treaty to be preserved. Although Egyptians have no appetite for war with Israel, many of them see the treaty as a badge of shame. Particularly hard for them to bear was former President Husni Mubarak’s collusion with Israel in maintaining the siege of Gaza. Egyptian opinion will now insist on an independent foreign policy, free from Israeli and U.S. pressures, which will allow Egypt to regain its rightful place in Arab affairs. Patrick Seale is a leading British writer on the Middle East. His books include The Struggle for Syria; Asad of Syria: The Struggle for the Middle East; Abu Nidal: A Gun for Hire; and The Struggle for Arab Independence: Riad el-Solh and the Makers of the Modern Middle East. .
Born in Belfast, Northern Ireland, he was educated at Balliol College, Oxford, and read Middle East history at St. Antony’s College, Oxford, where he wrote his first book. He has been honored by Oxford University with a doctorate (D. Litt) for his published work, and is a Senior Associate Member of St. Antony’s College. His journalistic experience includes six years with Reuters, and over twelve as a foreign correspondent for The Observer (London). He has covered the Middle East and France, as well as forays into Africa and the Indian subcontinent.